There have been many speculations among the Balkan historians as to what was the nationality of the Salonica (Thessalonica) brothers SS. 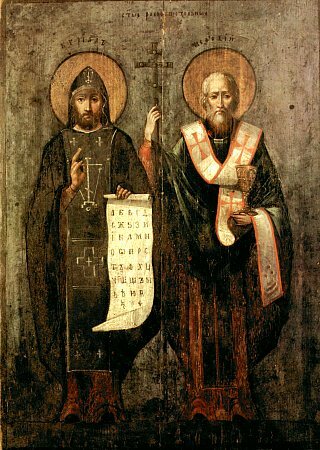 Cyril and Methodius, the Apostles of the Slavs. The Bulgarians consider them to be Bulgarians; the Greeks consider them Greeks; the Macedonians consider them Macedonians. We will analyze the three views below. 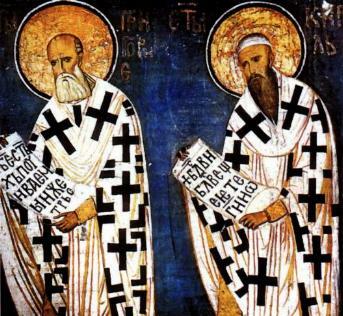 Cyril and Methodius came from Salonica (Thessalonica), the largest Macedonian city and the second most important city of the Byzantine Empire after Constantinople, the capital. The city was founded by the Macedonian King Cassander and named after Thessalonice, the daughter of Philip II and sister of Alexander the Great. Cassander married her after the death of her brother. Salonica was many times under siege by the Slavs, but they never took it. The Slavs settled the vicinity of the city and trhouout Macedonia, among the cities and villages already populated by the Macedonians. The Bulgars invaded the Balkans in the 7th century and also attempted and failed to conquer the city. The southern border of the Bulgarian empire stretched north of Salonica, but that empire was short lived. With these facts in mind it is simply impossible that Cyril and Methodius could have been either Slavs or Bulgarians for the obvious reason that the city was never taken by either one of them. Contemporary Byzantine records write of Salonica as the "greatest city of the Macedonians". Historical evidence confirms that the Macedonians existed in Macedonia, that the Macedonians served in the Byzantine army, and that the Emperors of the Byzantine Empire where ethnic Macedonians, both before and after the lifetime of Cyril and Methodius. As the documents over the last 2,500 years show, the Macedonians were not Greeks, and the explicit mentioning of Salonica as the city of the "Macedonians" in the Byzantine records, removes the possibility that Cyril and Methodius could have been Greeks. Cyril and Methodius' father was an important and influential city official in Thessalonica and held a high rank in the Byzantine society since the city was the second most important in the Empire. Not only that he was an important Macedonian but not too long afterwards the whole Byzantine Empire was ruled by the Macedonians from the Macedonian dynasty, period known as the Golden Age of the Empire. Thus there is only one possible and logical explanation for the ethnicity of the Salonica brothers - they were ethnic Macedonians, descendents of the Macedonians of Philip II, Alexander the Great, and Cassander. Under the direct order of the Byzantine Emperor Cyril and Methodius educated the Slavs which settled among the Macedonians in Macedonia in order to culturally integrate them into the empire, and for that act they became known as the "Slav apostles".